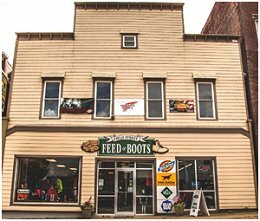 Boots, boots, and more boots – from children’s colorful puddle jumpers to high-water fishing waders, Field Street Boots in Kane, Pennsylvania, has an impressive selection of recreational and work boots for all ages and sizes. 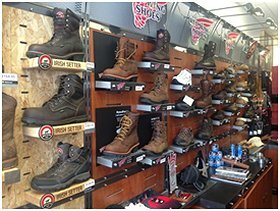 Outdoor equipment includes an extensive collection of fishing poles and fishing equipment, turkey calls, and hunting gear, rain proof coats or pants, and outdoor clothing. During season, 24-hour fishing bait is available.